A Mexican by birth and a United States citizen by choice, Ramos — who now lives in Miami and is the nightly television anchor at Univision, as well as a bestselling author and winner of eight Emmy awards for excellence in journalism — may be best known to most American news followers who are not regular Univision viewers as the Latino journalist who was physically ejected from a press conference held by Donald Trump on the campaign trail in Dubuque, Iowa, in late 2015. When Ramos stood to ask Trump a question about immigration, Trump brashly told him to “sit down!” then, “go back to Univision!” then signaled to one of his security men to show Ramos the door. “This IS my country,” Ramos countered. “I’m a U.S. citizen too.” Ramos has lived, legally, in the U.S. since he graduated from college in the early 1980s. As was always the case at similar lectures and readings I often attended in Taos, New Mexico, when I lived there, this large auditorium at the beautiful Bellas Artes cultural center here in San Miguel de Allende, Mexico, was filled to overflowing with mostly gray-haired, retirement-age attendees. (Where, I wondered then and wonder now, are the younger people at these consciousness-raising events?) Ramos stood alone on the bare stage, holding a microphone and speaking in calm, even tones in both English and Spanish. In the dead of night, somewhere in the deep South, Ramos sits across from a burly Ku Klux Klan spokesperson, flanked by his black-hooded, armed bodyguards. What looks like a bonfire flickers in the background, outlining the facing profiles of Ramos and his interviewee. The mood is tense. The KKK spokesman spouts white-supremacist rhetoric — along the lines of, “Of course white people are superior!” — unable or unwilling to answer Ramos’s soft-spoken but probing questions, such as, Why do you think that? That interview was short-lived, and the viewer is relieved to know that Ramos got out of it alive. As both a journalist and a Mexican immigrant, for Ramos the issue of immigration, now hotter than ever, is clearly near to his heart; and he is an unapologetic advocate for immigrants’ rights. But he is also deeply grateful for all that he’s been given in the U.S. “The United States gave me opportunities that my country of origin could not,” he said, “freedom of the press and complete freedom of expression.” Along with that gratitude, he expressed genuine optimism that things will, in time, improve. Was it my imagination, or did I also detect a slight, quiet, aching note as well, when he said, “I’m still looking for home”? 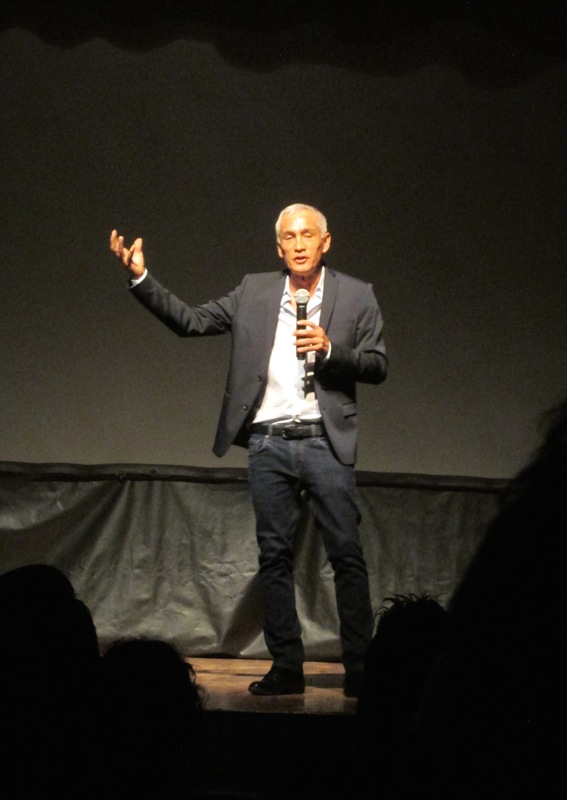 For an excellent, in-depth profile of Jorge Ramos by William Finnegan, go to “The Man Who Wouldn’t Sit Down,” in the October 5, 2015, issue of the New Yorker online.